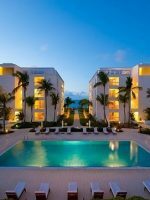 Enjoy views of Grace Bay from a studio or three-bedroom suite at the Regent Grand. 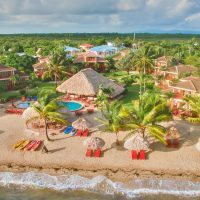 This luxurious resort offers families beachfront accommodations with kitchens, refrigerators, microwaves, coffee makers and more. Enjoy DVD players in your room, along with flat-screen TV’s and free Wi-Fi. Hop on a complimentary bicycle and head to the beach or the pool area. 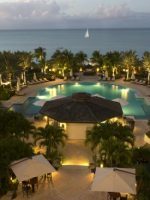 Enjoy the mosaic infinity pool or Grace Bay beach, where guests are offered complimentary towels and umbrellas, as well as beach service for beverages to quench thirst on a hot day. 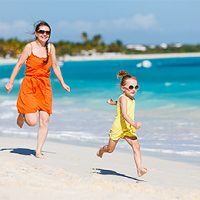 For children and teens who want to play and romp while parents relax, the SurfSide Kids Academy is a daily activity program that gives kids and teens opportunities to enjoy water sports, snorkel trips, boating adventures and more (for an additional fee). Swimming lessons are also offered. 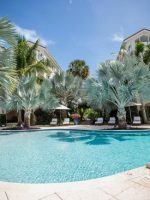 Parents can relax by the pool or beach, sip on a complimentary welcome cocktail or sign up for a couple’s massage at the Teona Spa, too. The Vix Bar and Grill offers families breakfast, lunch and dinner from 7:30 a.m. to 11 p.m. 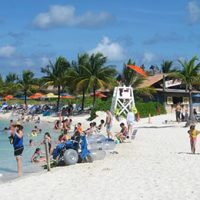 The resort offers complimentary breakfast for the whole family and special happy hours for adults. Room service is also available. I stayed in the Regent Grand hotel with my family the week of January 19 to the 26th 2019. I wish that when I made the reservation, I had been informed that they are starting to build a new Ritz Carlton hotel on a huge lot adjacent to the Regent Grand. All day long large cranes and trucks carry building materials and dump them on the site making a lot of noise. Construction men bang hammers against steel all the time. We cane to relax and were subjected to construction noises whether in the room, at the pool or at the beach. Really spoiled our vacation. The hotel offered to move us to another hotel but with a caveat - we would have to pay double for the additional cost of the other hotels. They then offered us a %9 discount on our hotel charges which we reluctantly accepted . The noises still did not go away. The Wi-Fi in the hotel was beyond description. First you had to switch between two different networks with different passwords depending on which part of the hotel you were in at any time. The Wi-Fi was most unreliable. We had to call the front desk several times to come and reboot the router in our room because it stopped working and we couldn’t access the Internet. Otherwise the WiFi was extremely slow and paused intermittently. Very frustrating. One day I went to the beach and asked the attendant (I think his name was Leon) for towels. He asked me for my room number. When I told him, he said I should go to another location (about 100 yards away) in the hotel to get my towels. Apparently, and we were never told about this, there are two competing groups in the hotel. When I asked him to please give me the towels this time he refused and insisted that I go to the other location for the towers. I am 81 years old and it was difficult for me to walk back and forth for the towers. At least out of respect for my age, not to mention being a guest of the hotel, he should have given me the towels and not insisted that I walk all the way to the other end of the hotel and back.. Ironically, that occurred on my last day at the hotel. Prior to that, I had no problems getting towels at the beach. 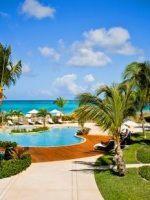 Regent Grand is a beautiful property on a great stretch of Grace Bay. The suits all have pool and ocean views. They are beautifully furnished and spacious. 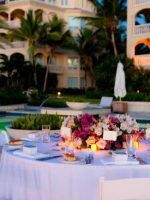 If you are expecting 5-star service for the price, lower your expectations. The residents board fought, and now there are two management companies involved. Pool has no attendants. It takes ages to get water and towels. There were loose wires hanging from dislocated pool lights. And if your suit belongs to Bianca Sands company, you cant charge anything to the room. Unbeatable location though, walking distance to main street with great restaurants.